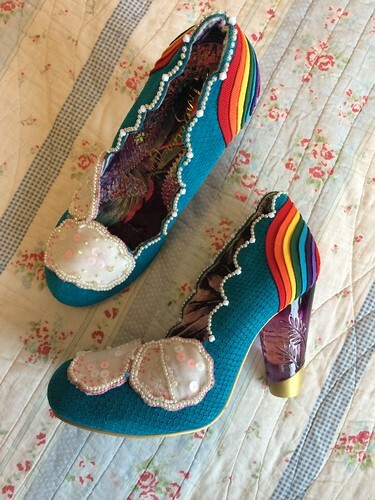 t*rexes and tiaras: Sunday Shoes 086..
Not the Irregular Choice shoes you might have expected if you're an Irregular Choice follower. The long-awaited Star Wars collaboration launched this week, but I have to admit having never seen the movies I'm not really interested in them. The recent Star Wars hype has rather passed me by of late, which is fine. These, to me, are much more exciting. 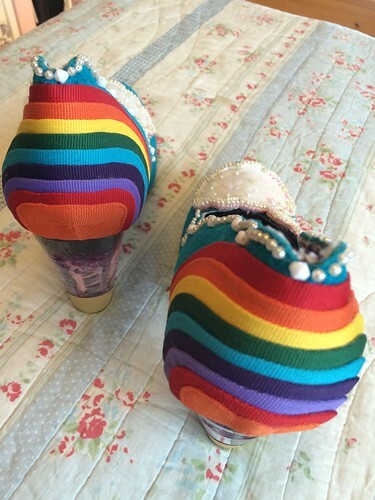 Shirley Bass are adorned with rainbows (made up of layered tape detail across the backs of the shoes) and cloud, which have hand-beaded edges - a feature which is continued around the scalloped edge of the shoe. The base is a lovely bright blue suede-like texture, and frankly there isn't a detail I don't like about these. They're finished with the ubiquitous perspex heel, of course, which ensures the shoe has a comfortable and sturdy feel to it. The sizing is spot on with these; my regular size fits perfectly and I hope this means that IC have finally ironed out the kinks of inconsistency of recent times. I've got to admit, I've never really been interested enough to watch Star Wars. I'm still not fussed about seeing the Star Wars movies. Argh you got these! My wishlist is so big this season, but I'd need like 90% off to be able to afford/justify it all. Can't see that happening ; ) I got annoyed when people moaned about the pricing of these. 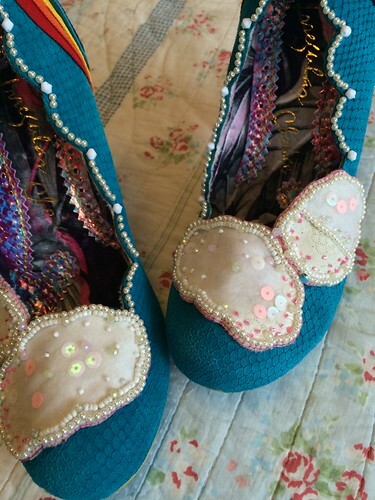 Yes they are expensive, but there's lots of hand beading, different materials and colours used, so I can see why they cost that. I think these ones actually came from the US as my size was sold out on the IC site, and they were a lot cheaper, even with the US shipping. Mad.